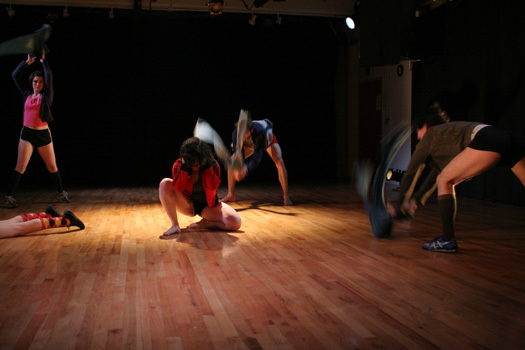 Daniel Linehan re-visits The Sun Came, a choreography for five dancers originally created in New York in 2005-2006. In this piece, Linehan creates an eerie atmosphere in which human loss takes on a haunting presence. There is a sense that the events onstage are taking place in the aftermath of an unnamed cataclysmic event. 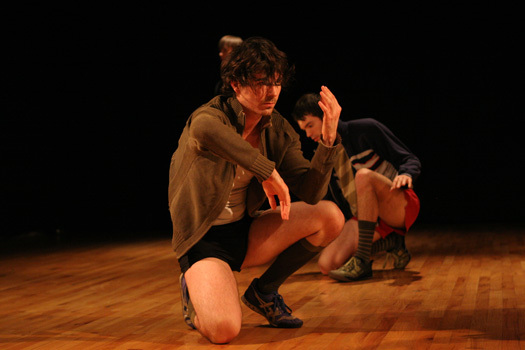 The performers onstage struggle with their limited options and few choices for movement. They respond to their highly constricted situation by passing through different modes of intensity: ferocious tension, manipulative interaction, and melodramatic outbursts. The question being posed is: how would we create meaning after losing our capacity to piece things together into a meaningful narrative? The dance occurs amidst a barrage of monotonously chanted words— taken from news reports and fictional tales—that have been spliced together in such a way that they have been stripped of their context, imitating the fragmented way that we absorb an accumulating overload of data. Ultimately, the dance is fueled by the urgent energy that comes from striving to locate meaning within a boundless stream of information that offers no immediate answers. This work was originally created, in part, with a space grant from BAX/Brooklyn Arts Exchange with support from the Dance Program of the New York State Council on the Arts and the NYC Department of Cultural Affairs.